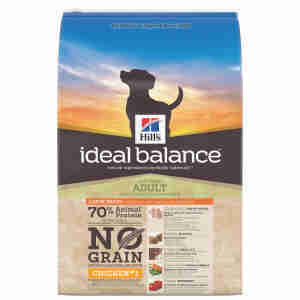 Hill’s Ideal Balance Adult Large Breed No Grain Dog Food is a complete dry food for large breed adult dogs (weight more than 25kg). Natural ingredients provide an optimum level of nutrition for dogs of large breeds, which weigh more than 25kg. Chicken is the main ingredient, providing a great taste and lots of protein, helping your dog put on build muscle and stay in shape. Potato (which is naturally gluten-free), prevents any food sensitivities and aids easy digestion. Omega 3 and 6 maintain a healthy skin and coat, improving their natural protective function. Rich in vitamins and minerals from vegetables and antioxidants from cranberries, this kibble gives your dog enough energy and helps to protect from disease and infection. Chondroitin from pork cartilage and glucosamine from crustacean shell prevent cartilage disintegration and supporting your dog`s mobility. Chicken meal (25%), dried potato (14%), potato starch, yellow peas (12%), dried peas (12%), animal fat, digest, vegetable oil, flaxseed (2%), minerals, dried beet pulp, dried carrots (0.5%), dried tomato pomace (0.2%), dried citrus pulp, dried grape pomace, spinach powder, pork cartilage (source of chondroitin sulphate), crustacean shell hydrolysate (source of glucosamine). Protein 26.7%, Fat content 15.6%, Crude fibre 2.7%, Omega-3 fatty acids 0.81%, Omega-6 fatty acids 3.09%, Crude ash 5.0%, Calcium 0.81%, Phosphorus 0.63%, Sodium 0.30%, Potassium 0.74%, Magnesium 0.08%; per kg: Vitamin E 730mg, Vitamin C 115mg, Beta-carotene 1.5mg. Vitamin A 37,826IU, Vitamin D3 1,589IU, E1 (Iron) 220mg, 3b202 (Iodine) 2.2mg, E4 (Copper) 27.9mg, E5 (Manganese) 9.7mg, 3b603 (Zinc) 187mg, E8 (Selenium) 0.4mg; with natural antioxidant. Always make sure that your dog has access to plenty of water.